The candidates are asked to submit their application forms for ADB Japan scholarship program 2018. 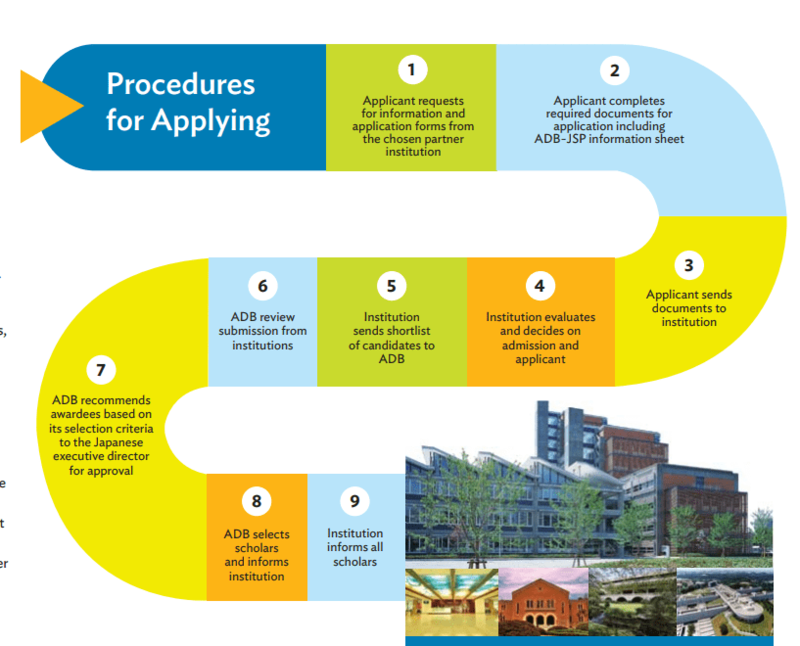 ADB is inviting the eligible and qualified students from ADB member states to send their application forms for Asian Development Bank (ADB) Japan Scholarship program. Asian Development Bank / Japan Scholarship program (ADB / JSP) offers 150 postgraduate scholarships every year to carry out study in the management, science & technology, economics and various other development related fields. The ADB JSP scholarship 2018 covers full tuition fees, monthly allowance for expenses, housing, books and instructional materials, medical insurance and travel airfare tickets. Scholarship Duration: 2 years for masters & 3 years for doctorate programs. ADB-JSP is the fully funded scholarship program and it is added with all cost of scholarship during the period. The scholars, who are engaged in carrying out research, the special grant may be provide for preparation of their thesis. The national of ADB borrowing member and Japanese ODA scholarship are eligible. The list of eligible country is provided here. The students will be granted admission to an approved MA/ Ph.D. course at an academic institution. Having bachelor degree or its equivalent with superior academic record. At least two (2) years of full-time professional working experience (acquired after a university degree) at the time of submission of application. The students must be proficient in oral and written English communication skills, which can make them able to pursue studies. The candidate should show that he is agreed to return to his/her home country after completion of studies under the Program. ADB-JSP does not consider the applicants, who are enrolled in postgraduate degree programs. ADB-JSP is not willing to sponsor the candidates for undergraduate studies, distance learning programs, short-term training, conferences, seminars, thesis writing and research projects. The candidates can find out how to apply for ADB Japan scholarship. They need to read further information given under the link here how to apply. The step by step procedure is mentioned here.